Bill Maher looked at the unusually low attendance for the Frozen Four, and acknowledged this much: Price in the marketplace for tickets was a concern. 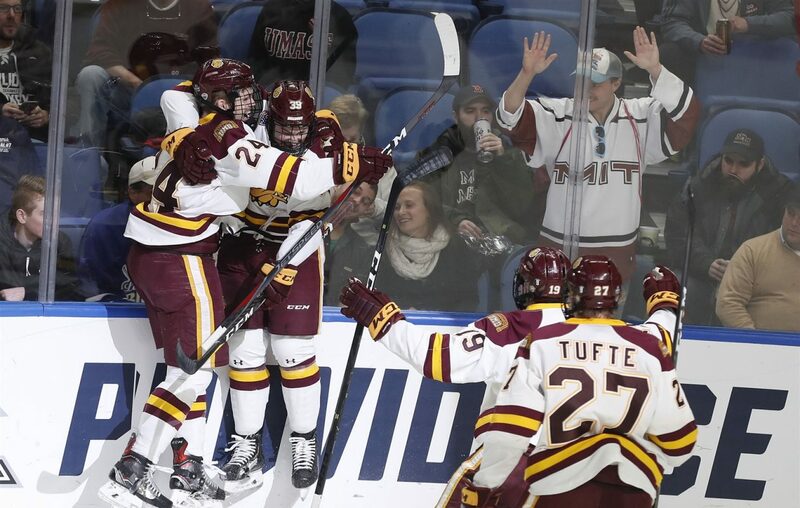 Minnesota Duluth won its second consecutive national championship in men's hockey Saturday at KeyBank Center, but the Bulldogs won inside an NHL venue that had nearly 5,500 empty seats for the title game. Maher, Canisius’ athletic director and a tournament co-director, on Monday addressed the uncharacteristic drop in attendance at the Frozen Four championship game. Ten previous host venues had average crowds of at least 17,806 for the Frozen Four, according to NCAA records, and the 13,624 at the Frozen Four national championship game Saturday in Buffalo was the lowest attendance for the title game since 2001. Much of the public criticism regarding the Frozen Four centered around the cost of a ticket for the Frozen Four and the inflexibility of purchasing single-game tickets, at least initially. One ticket for the two semifinal games and the national championship game cost $300 for a seat in the lower bowl, while a seat in the upper bowl cost $210-$215. According to the NCAA, ticket prices for the 2018 Frozen Four at the Xcel Center in St. Paul, Minn., were $290 a ticket in the lower level for three games, and $175 per ticket in the upper level. The local organizing committee that secured the bid to bring the Frozen Four to Buffalo included Pegula Sports and Entertainment and the Metro Atlantic Athletic Conference, of which Canisius is a member. Through a spokesman, Pegula Sports and Entertainment referred comment to the NCAA, regarding low attendance at the Frozen Four in Buffalo. Maher also said a post-mortem of the event will be done both by the NCAA and the local organizing committee in the next couple of weeks. Erie County Executive Mark Poloncarz theorized Sunday on Twitter why the event was a low draw: cost-prohibitive. Maher offered a similar explanation. Yet even with a public outcry, the cost of tickets couldn’t be exponentially lowered to satisfy consumer interest. Single-session tickets were only made available in recent weeks, and on Friday, NCAA.com listed tickets for the national championship game that ranged from $120 to $240. Otherwise, those interested in attending the national championship game sought out tickets on the secondary resale market, where the average cost of a ticket was around $60, and went as low as $40, in the hours before Saturday's title game. “Pricing of the tickets is something the NCAA looks at,” Maher said. “They’re trying to maximize revenue from the event, and that’s a deciding factor. The cost of tickets was also tied to the bid that the committee submitted to the NCAA in 2016 for Buffalo to serve as host. Potential tickets prices were included in Buffalo's bid to the NCAA in 2016, although the NCAA had to approve final ticket prices based on the recommendation of the local organizing committee, a spokesman said.